Twelve New Jersey men were charged with alleged multistate conspiracy to traffic in drugs and untraceable illegal “ghost gun” assembled from kits purchased online. 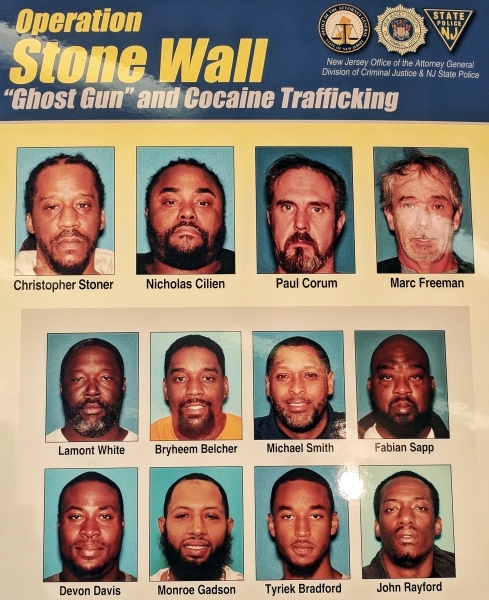 The yearlong sting codenamed “Operation Stone Wall” mainly focused on a cocaine ring operating in southern New Jersey. The operation took an unforeseen twist when law enforcement authorities realized the involvement of illegal gun trafficking through a conversation between two of the alleged members talking about do-it-yourself firearms. According to the AG’s office, four of the men are charged with conspiring to sell six untraceable AR-15 assault rifles. In connection with the investigation, officers seized thirteen guns, including the six-ghost gun AR-15s, and illicit drugs, drug packing materials, and cash. New Jersey already has some of the country’s toughest gun laws, signed by New Jersey Gov. Phil Murphy, which makes it a crime to buy, manufacture, possess or sell guns that do not have serial numbers, making them difficult to trace. However, there is no law to background checks for online purchases of the firearm kits and assembled them at home with the help of online videos and instruction. The so-called “ghost guns” are untraceable as they are assembled outside of the manufacturer’s control and do not have a serial number for background check nor are they registered with any law enforcement agencies, providing terrorists and criminals with an adequate weapon for the crime. Every time there is a mass shooting in the United States or anywhere around the globe, a debate about reforming the nation’s gun law begin anew. Some experts believe we don’t have a gun problem rather we have a people problem while other demand strict gun laws and harsh punishment for perpetrator/s. However, irrespective of ongoing debate, government or law enforcement personnel haven’t found a permanent solution to this threat. The number of mass shooting incidents in the United States continues to rise. According to the Gun Violence Archive, 61 mass shooting incidents have occurred as of March 19th, 2019 and in 2018, 340 mass shooting incidents occurred across the US. Last year, the most monstrous mass shooting was Pittsburgh Synagogue Massacre with AR-15 rifles. Drug and illegal guns are the dual catalysts driving violence on the street. Ghost guns are a significant threat to public and law enforcement safety. As ghost gun manufacturers exploit loopholes in laws by providing untraceable guns to criminals and terrorists which further being utilized for mass shooting or terrorism. This incident isn’t the first or the last that law enforcement personnel encountered. Across the country, there have been arrests involving ghost guns- just merely foot soldiers, but officers couldn’t identify the ring-leader or the root of this global dilemma. It is understood that other trafficking rings also operate in the same fashion. The important question for the reader is whether the law enforcement personnel would wait for another mass-shooting incident or would use this case data to crack open all the unidentified trafficking ring dealing in drugs and illicit firearms in the United States or elsewhere. Just to revive the memory, the most recent incident of mass shooting in the last two weeks is Gunman opened fire in a tram in the Netherlands and Christ Church shooting in New Zealand. In most of the cases, law enforcement personnel are aware of the potential threats and perpetrator/s however, evidence or verifying his or her hideous plans of attack can be a very lengthy process. Here, the officials made their first arrest after a yearlong sting “Operation Stone Wall”. How to disrupt a trafficking ring as well as uncover all related crimes in a way that is not time-consuming and ensures optimal utilization of law enforcement resources? iCognative leverages forensic capabilities to unprecedented levels. Keeping in mind the importance of time-sensitivity and quality of information, it is best positioned to support intelligence collection and investigations at all levels of law enforcement. Sting operations or existing conventional investigative tools opted by law enforcement personnel for investigation and intelligence-gathering are outdated and inaccurate as these tools do not guarantee accurate results, take more time, and do not reveal what specific crime-related information the suspect possesses, necessary for officers to identify the mastermind, unidentified trafficking rings and seized illicit guns and stop future mass shooting. So, what alternative options do law enforcement agencies have? With the advancement in technology and neuroscience, Brainwave Science, a US-based company, has launched the most revolutionary technology of the century that guarantees accurate results, reveals what specific crime-related information the suspect possesses and identifies the perpetrator from the innocent with nearly perfect accuracy and it’s called iCognative. Today, criminals are smarter and more adaptive to respective situations, legal loopholes are easily manipulated. No matter how stringent are the laws the criminals know how to work around them. In order to identify the perpetrator from innocent before a mass shooting or terrorist attack, iCognative enables the law enforcement personnel to determine who is the criminal or a domestic terrorist and who is the innocent with nearly 100% accuracy. Further, this technology reveals what information suspect’s brain possesses and/or is trying to conceal from the investigator. iCognative guarantees almost perfect accurate results without any possibility of error and subject or investigation cannot influence the results of the iCognative test. How? Simple! This fully automated technology accomplishes these results and accuracy by matching crime-related information through specific brainwave called P300 using a proprietary headset. The United States law enforcement agencies should utilize iCognative technology is such multifaceted and tedious cases where officers need to wait for years to gain substantial evidence and information. iCognative is the only technology in the security market capable and ready to solve the growing gun violation and violence problem in the US. In this case, all the necessary crime-related information could be accessible and verified with almost perfect accuracy once a 45-minutes iCognative test is conducted by law enforcement personnel on 12 New Jersey men. Information such as, identification of the buyer of AR-15 rifles, how they traffic guns and drug, methods of assembling, connection with previous mass shooting in the United States, specific codes used, connections to known or unknown terrorists, details of financials, identification of key people and trafficking ring operating in the country, etc., would be easily available to law enforcement agencies to investigate this case. iCognative could potentially lead them to the ringmasters of this drug and gun trafficking ring in no time. An assigned investigator uploads all the investigate details of this case and previous cases into the iCognative system protocol. The system records and analyzes the brain responses when case related and confidential information (together called Stimuli) is flashed to the suspects on a digital screen in the forms of pictures, phrases or words and determine with over 99% accuracy what information suspects possess and/or trying to conceal from the investigator. iCognative assures that no perpetrator can cheat or hide any crime-related information or remained unpunished for his crime. Brainwave Science’s iCognative is the best weaponry for law enforcement personnel to investigate such threat, eliminate gun violence and drugs trafficking, irrespective of the ongoing debates in the US Senate regarding background checks. You want a change, iCognative provides the key. No other security solution can meet the superior performance, ease of implementation, and cost-effectiveness of iCognative.